My favorite marten is the one I photographed yesterday. It was my second attempt. 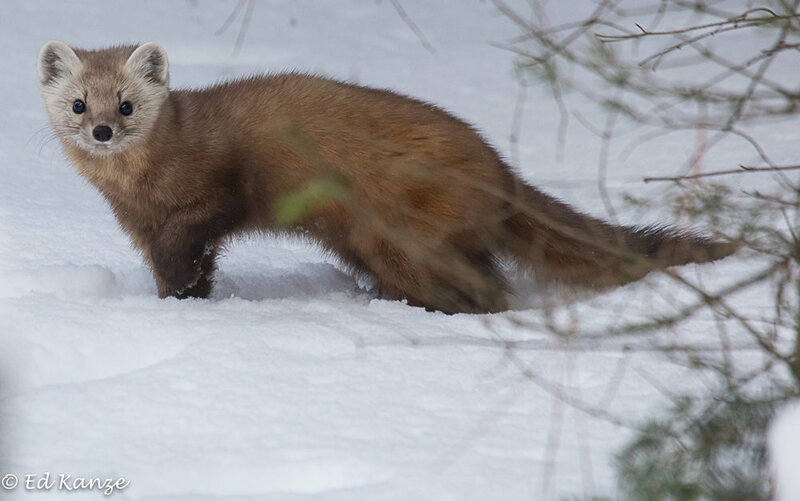 The last time I’d made an effort to chase down a reported American marten, I spent hours tromping around in subzero temperatures, in a stiff wind, seeing exactly none. Then came yesterday. All my troubles seemed not so far away as my daughter, Tasman, and I slogged around in the cold, warmed up inside a building, slogged around some more, warmed up inside the car, slogged around some more, and saw a good deal more of nothing at all. 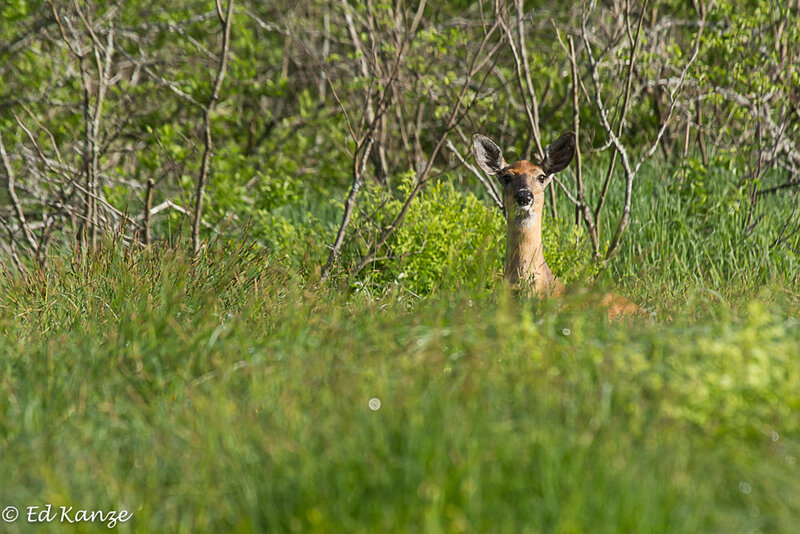 But perseverance has a way of eventually rewarding the nature photographer. Knowing that to be true, when Tasman retreated to the snug interior of the car for the last time, I made a final circuit through the snowy patch of forest generously dotted with marten tracks. Again, nothing. I was working hard to accept defeat stoically yet again as I turned back toward our Toyota. Just then, at the last possible moment, I saw something—-just a glimpse out of the corner of an eye. A rusty, fluffy tail, too long and long-haired to be a red-squirrel’s, was disappearing up a tree. I knew what I’d seen. It had to be that cutest and most nimble of all mammals of the North Woods, the arboreal American marten. American martens are often called “pine martens,” the name of a European cousin, Martes martes. But Adirondack martens are not pine martens. Members of the weasel family, they belong to a North American species, Martes americana, known to those who care to tell one marten from the next as American martens. The selfish side of me wanted to charge into the woods and pursue the creature that had been eluding me, and in whose pursuit I had suffered chattering teeth and twenty cold fingers and toes. But my daughter had worked hard for this marten, too. So I ran and got her. Together, we plodded through deep snow to the bottom of the tree. We looked up. Nothing. We looked in surrounding trees. More nothing. Then we saw movement, and for the next hour, we exulted in the marten’s company. To our surprise, it seemed to have no fear of us. During that hour, the only thing that seemed to rattle it was a circling, squawking raven. Here are a few of the rakish poses the marten struck for us. What a face! 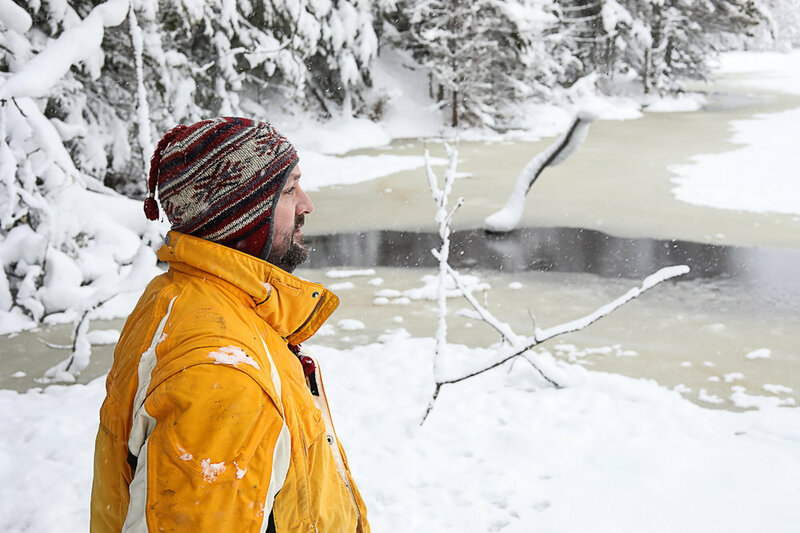 Passing the long, cold winter in the Adirondacks often calls for a little creative reinvention. I’ve been amusing myself of late spending time with a muskrat. Whether it’s Muskrat Suzie or Muskrat Sam (if you remember the corny Captain and Tenille song “Muskrat Love”) I’m not sure. But this much I know. A handsome individual of this species, gender uncertain, has been swimming, diving, and perching on the ice along the Saranac River lately, and I’ve had the pleasure of spending a few hours with it, shooting photos now and again. 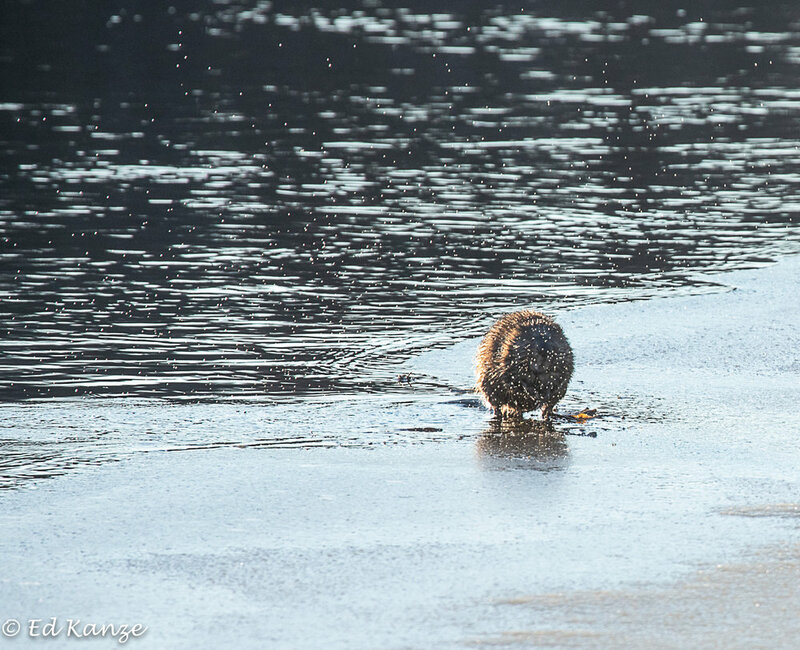 Above, here’s the muskrat walking the brink, getting up the nerve to take its next cold plunge. And below, here it is, just about to submerge. And here it is again, below, fresh up from a dive. The muskrat looks quite satisfied, as well it should. And here is the muskrat again, gnawing a sturdy stem. And here it is again, the big pieces gone, nibbling something small. Above, the muskrat was looking waterlogged. I suspect it was and preferred to be dry. From time to time, this is how it resolved the issue (below). Below is the last image I offer. It shows my muskrat friend, dusted with snow, looking pensive. It has good reason to be pensive. The river is freezing over, open water is disappearing, and a big snowstorm looms. 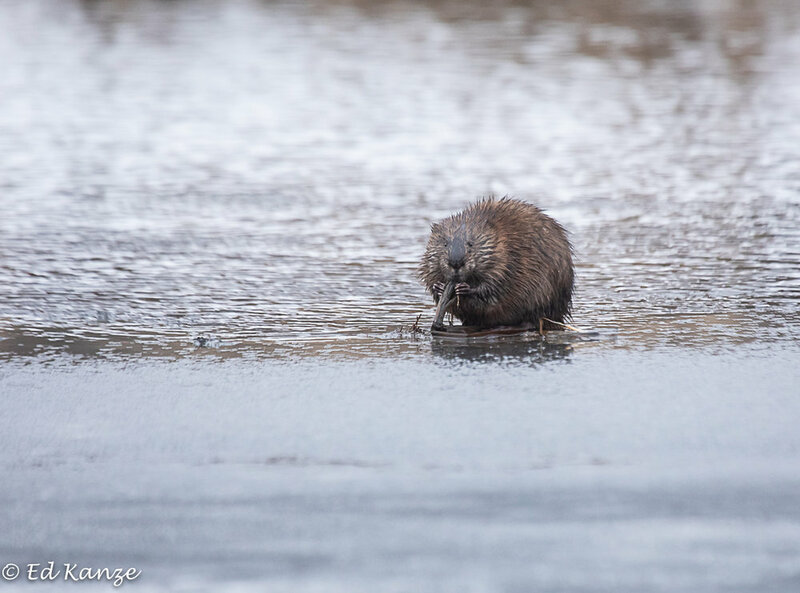 Unlike the beaver, which builds a lodge and stores great quantities of food and prepares for such conditions, the muskrat improvises its way through winter. Why not? 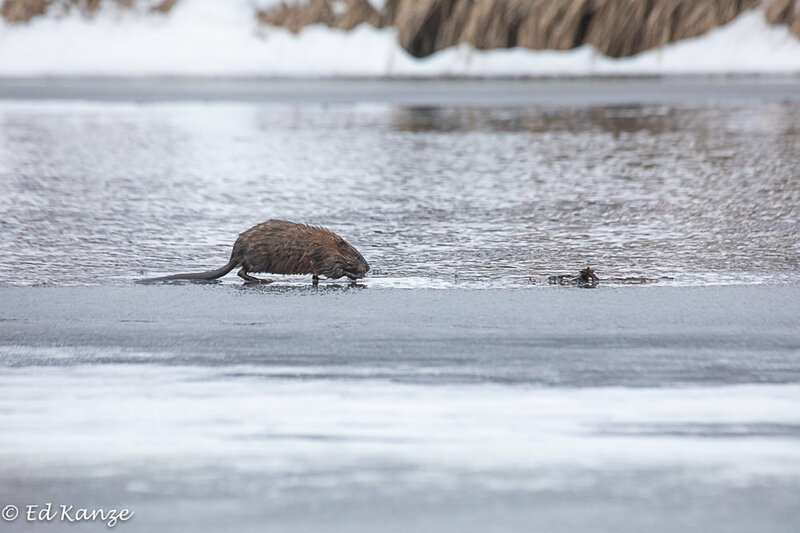 The muskrat’s success at living life moment by moment demonstrates that for aquatic rodents, as for people, there’s more than one way to live. According to a calendar that hangs on our pantry door, winter begins on December 21. Here in the interior Adirondacks, that’s hogwash. Since mid-October, one snowfall after another has fluttered down upon us and, in most places, the ground has frozen to the consistency of concrete. 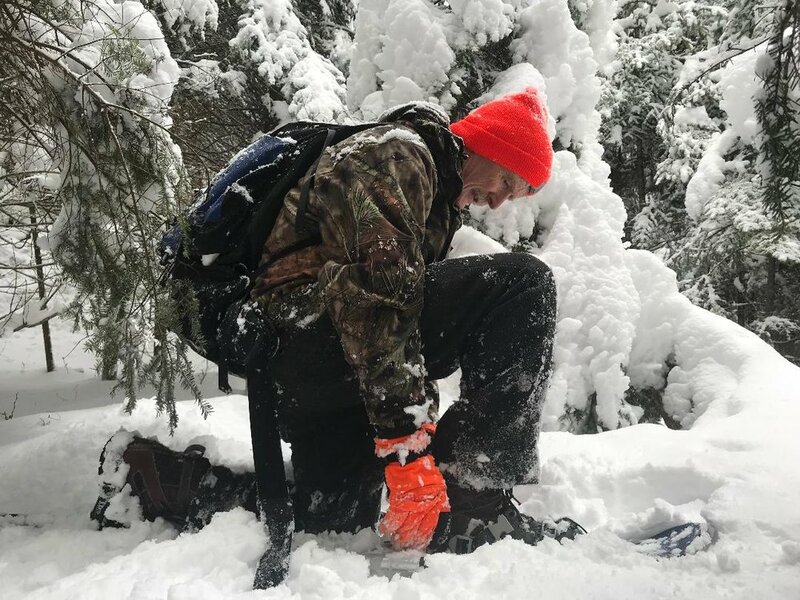 Step into the woods and you lose your feet— unless, of course, you’re wearing snowshoes. A few days ago, I made a trek on boreal footwear to a beaver pond two or three miles deep in the woods. My friend, neighbor, and partner in Curiously Adirondack video production Josh Clement was with me. When he and I meet to discuss business and make creative decisions, we often hold a meeting on the move. This time of year, that usually involves skis or snowshoes. Here’s Josh, on the shore of the pond the beavers created. A moment before, he saw one of the rodents grooming itself, but before he could pop a photo, it plunked into open water and disappeared. When you point a camera at someone, the favor (if one can call it that) is often returned. Below you’ll find a shot Josh took of me. One of the troublesome bindings on my LL Bean snowshoes had let loose yet again, and I was in the process of digging out the shoe and strapping it back on, all while trying not to tumble. If I look a bit tense, it’s because I was a bit tense. In the deep, wet snow, the going was challenging. 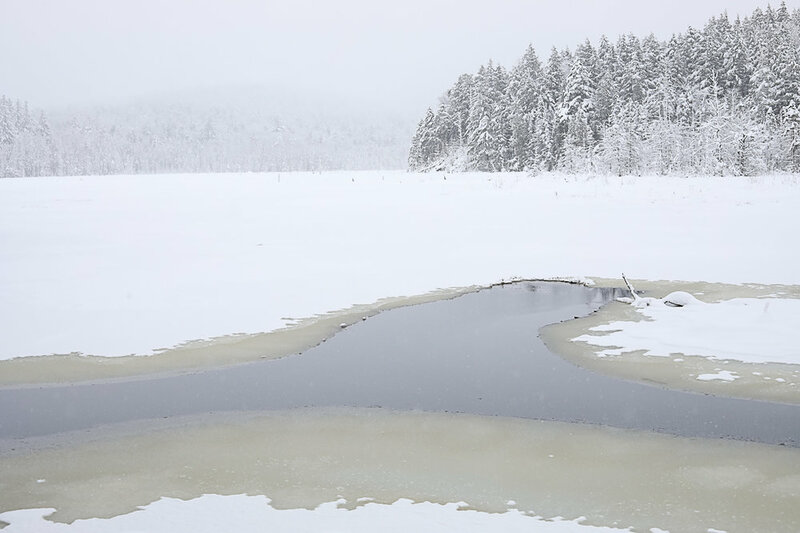 Earlier, I’d taken a fall when one of my snowshoes plunged into a watery hole between sedge hummocks. Wind had blown the snow in that spot three and four feet deep, and righting myself hadn’t been easy. Still, oh my, it was magnificent out there. The weather was mild, with no wind and the temperature just below freezing. 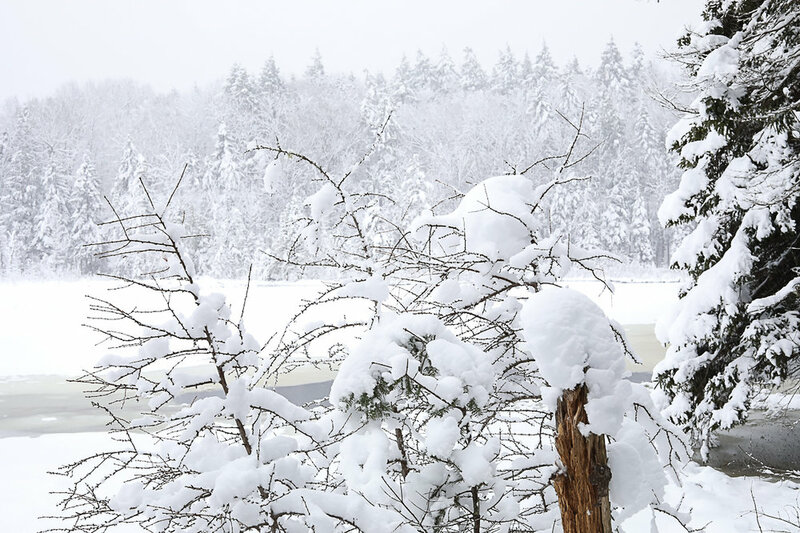 A recent snow had come down on a warm night, and wet flakes had piled up thick and fleecy on the limbs of conifers. With so much fluffy powder everywhere, absorbing sound, there was hardly a peep to be heard until something like rolling thunder reached our ears from the direction of Moose Mountain. An avalanche! We heard one blast, then a second. It made us glad we were far from the nearest steep slope. Safety is critical in the back country at all times of year, but especially in winter. I’ll close with five photos. 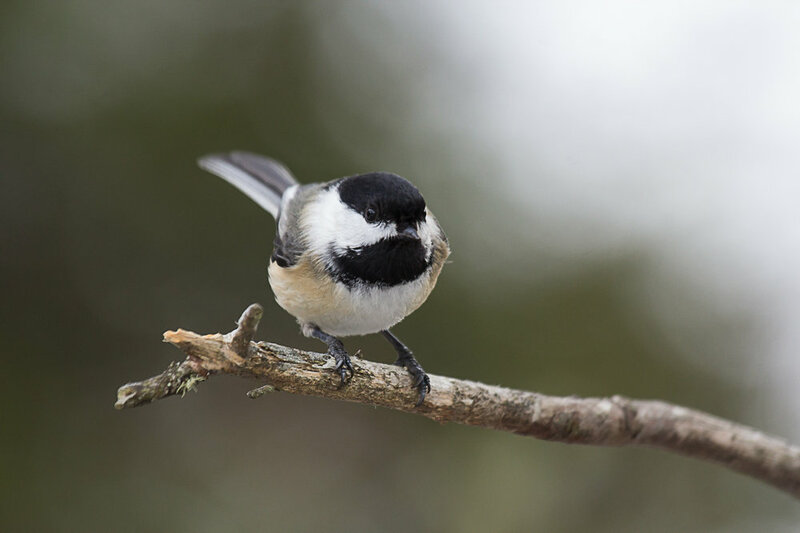 The first shows a black-capped chickadee, the only bird we saw during our outing. The second and third show a beaver lodge, in winter and in June. The fourth and fifth show the pond the beavers built, again, in winter and in June. It’s a fabulous thing about the Adirondacks: you can come to the same spot month after month, and it’s never, ever quite the same. 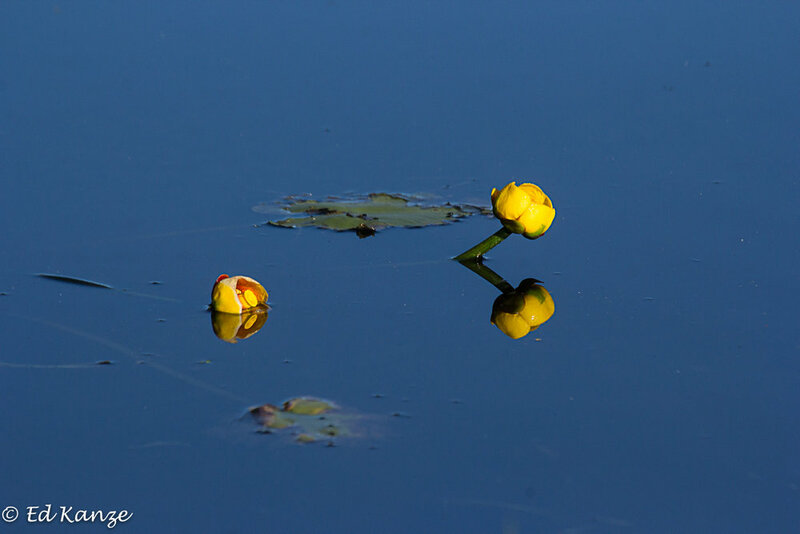 Which is why a forthcoming book of mine will feature this same pond, contemplated over the course of a year. The more time I spend among my fellow species, and among my own, too, for that matter, I marvel at the individual nature of us all. Yes, humans have more in common with each other than they do with chimps, and red maples share more with each other than they do with sugar maples. Yet look closely, and you’ll find variations not only between species but within them. I illustrate the point with a red maple tree, neither large nor small, that grows beside a pond near our home in the Adirondacks. You see this tree in the photo above and in the two immediately below. Every year, this tree glows a juicier, more vibrant shade of red than the other red maples in the neighborhood. Why? At heart it’s a matter of biochemistry, biochemistry that varies from one tree to the next thanks in large part to the gene-scrambling sexual reproduction of maple trees. Male red maples broadcast pollen into the air (see an earlier post here about distinguishing the genders of red maples). Some of it, with luck, lands on female red maple flowers. Genes mix, and voila! Diversity is born, a diversity that helps the trees survive and flourish in ever-changing times. Whether I look at this especially handsome red maple from a distance, up close, or reflected in the pond, I’m inclined to think it’s the most glamorous I know. We’re pleased to have it as a neighbor. Summer is loon time in the Adirondacks. These signature diving birds of clear northern lakes return to us in spring, having spent the winter dining on East Coast seafood. When the ice goes out, the loons come in. In short order they're hooting and yodeling and renewing bonds with old mates or forging new ones with paramours. 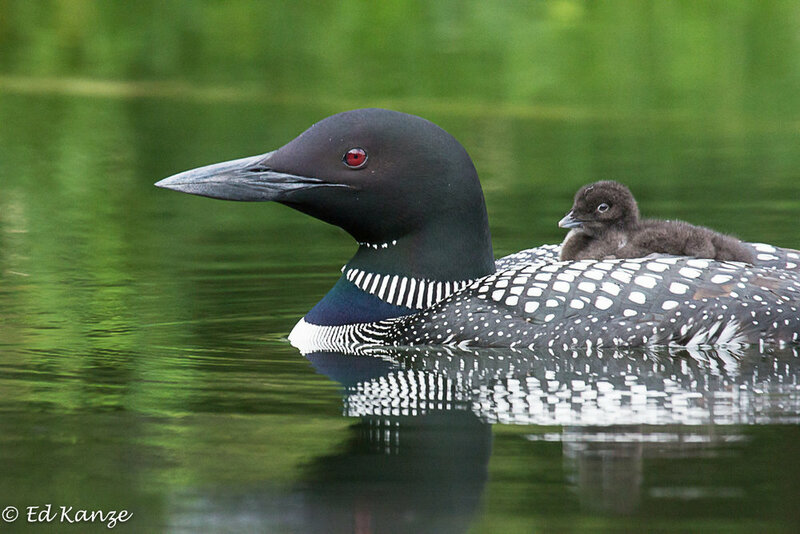 I vowed to get to know loons better this year, and to expand my archive of photos of them. Approaching near-tame birds on a lake where they're accustomed to seeing people and boats, I managed to win their trust and spend several happy hours among them. My loon companions were a family of three: a male, a female, and a chick not many days out of the egg. Interactions within the loom family seemed tender. The parents interacted gently, with one sometimes feeding the other. 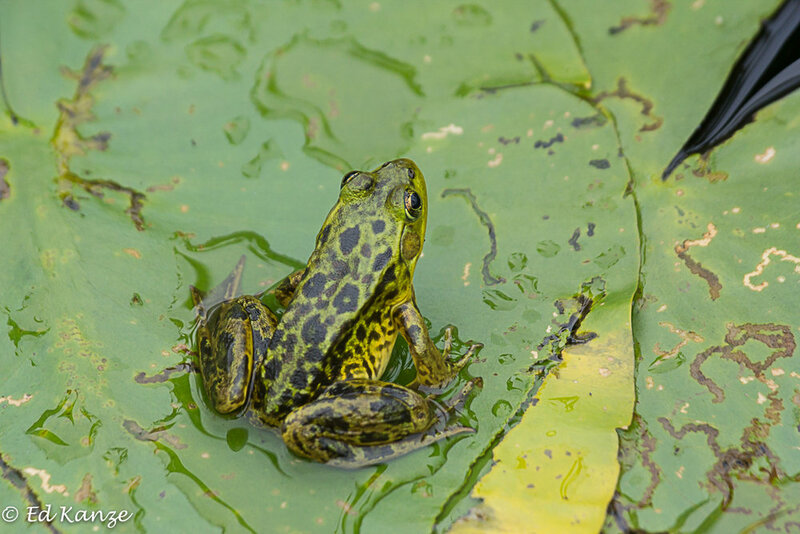 Males and females are all but identical, with the males being slightly larger. The chick, not much bigger than a tennis ball and similarly fuzzy, seemed to enjoy snuggling up to each parent equally. Fatigue seemed to come over the baby loon now and again. 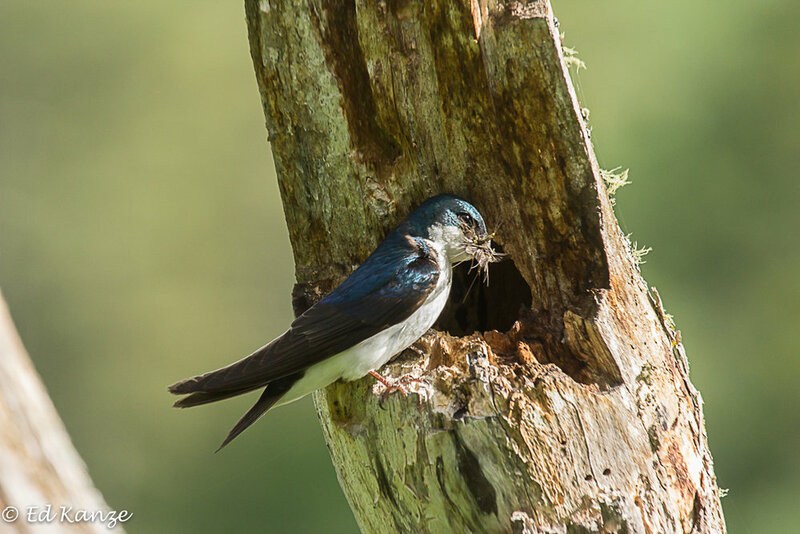 Sensitive to the situation, one of the parents (it seemed each time to be the smaller female) would edge up to the little one, lift a wing, and invite it to crawl up and underneath. Sometimes the chick would stay there, out of sight. Other times it would wriggle on top and either take a rumble seat in the back or smuggle up to the big bird's neck. 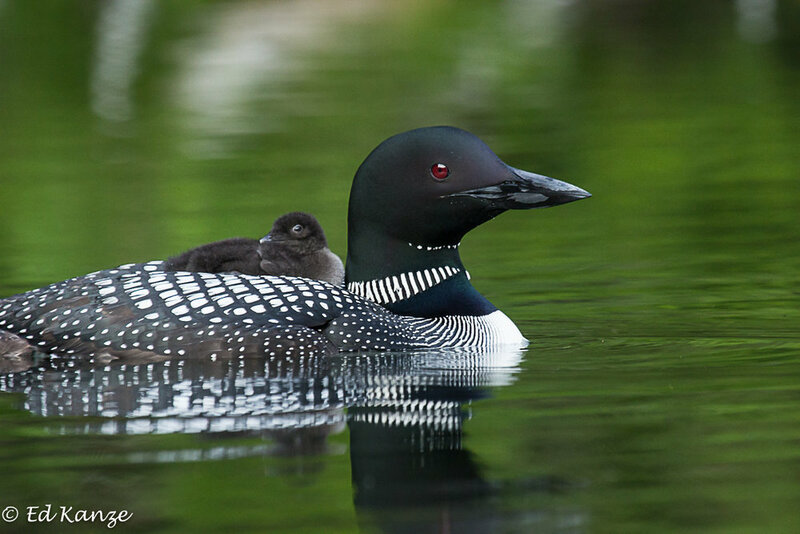 Loons feed on aquatic life: fish, crustaceans such as crayfish, insects, and more. I watched the parent loons feed each other and feed (or attempt to feed) their chick small slender fish, crayfish, and water striders they plucked from the surface of the cove. 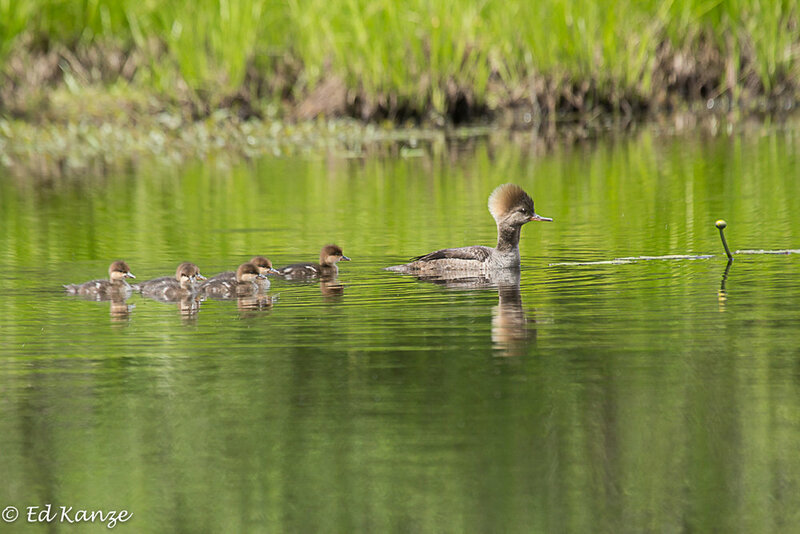 While watching parent loons tend a chick or two is a thrill, a great part of the appeal of loons is their almost-too-good-to-be-true beauty. 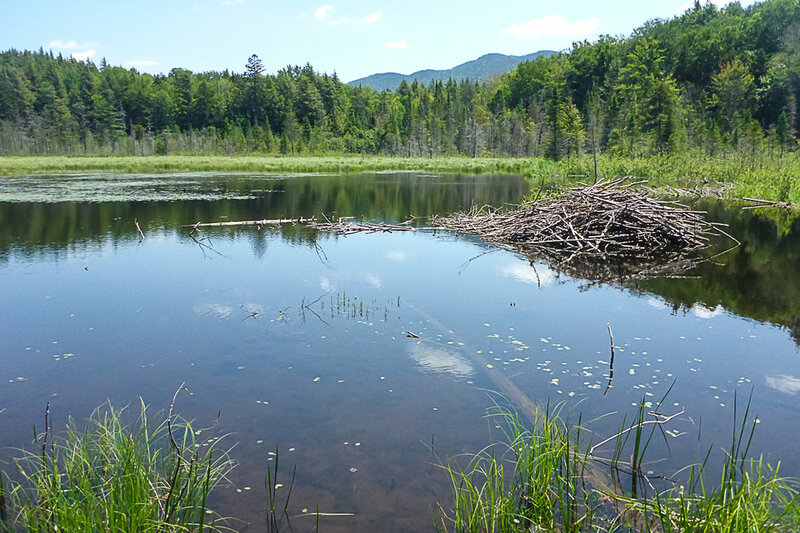 I've admired loons on Adirondack lakes for forty years. Still, each time I get a good look at one I'm astounded anew by its handsome shape, the intricacy of the black-and-white checking (the black turning to metallic green or purple in the right light), and the blazing red eyes. On top of all that, loons speak expressively. There can be few experiences more thrilling than standing on the shore of a wild northern lake at night and hearing the haunting wail of a loon rising and falling from a point unknown, somewhere far out in the darkness. 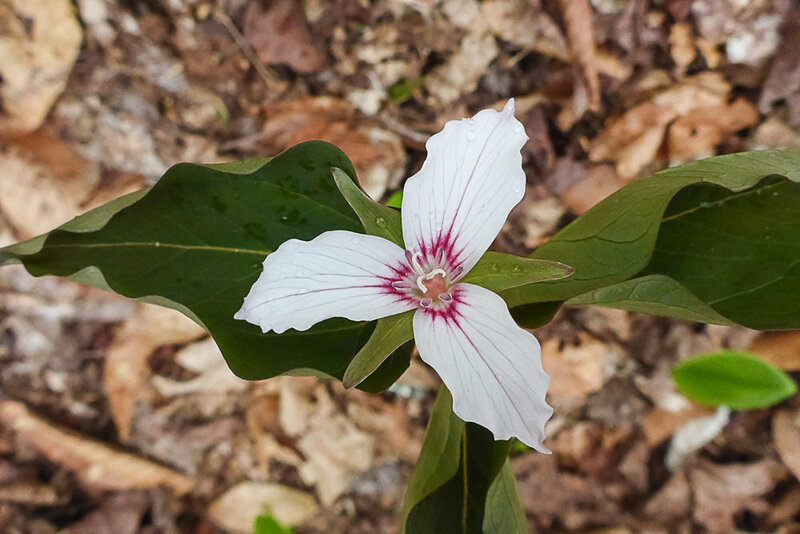 The wildflowers of our brief, blink-or-you-miss-it Adirondack spring have to work fast. They need energy to open blossoms made and tucked in cold storage the preceding year, and they need to produce nectar, pollen, and ovaries ready for seed-making. It's a race to get leaves up, flowers out, and pollen delivered before deep shade comes over the forest and slows things down. 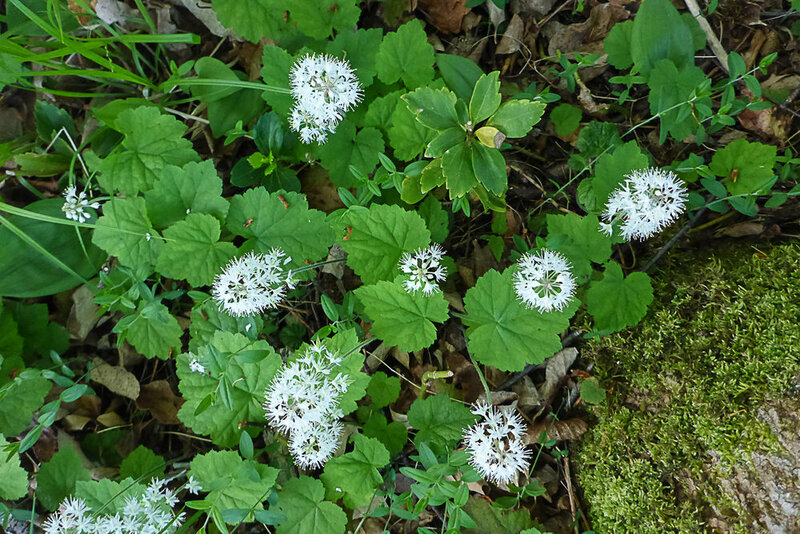 Because our spring flowers appear so briefly, they're sometimes called "ephemerals." You won't forget them. 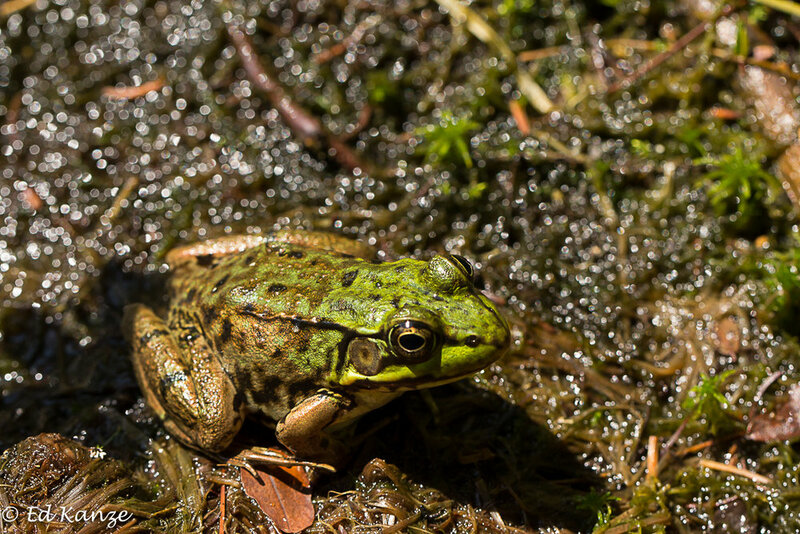 Here are images of ephemerals I photographed in our neck of the woods this spring. Can you identify the ones in the image above? 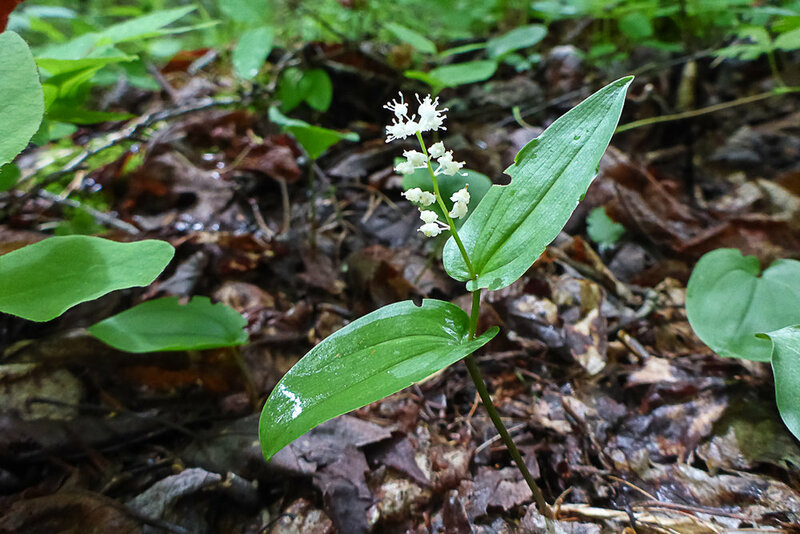 You'll find a different photo of the same plant identified below. Red trillium, Trillium erectum, also known as "stinking Benjamin" and "wet dog"
Canada mayflower, Maianthemum canadense, also known as "wild lily-of-the-valley"
When Adirondack red maples burst into blossom in springtime (our deciduous trees are really just giant-sized wildflowers) not all the blossoms are identical. Some red maples have flowers that look like those above, photographed near our mailbox. These are female flowers. In time, assuming they're pollinated, they'll ripen and produce winged seeds. The particular tree that bears these flowers is a female tree. 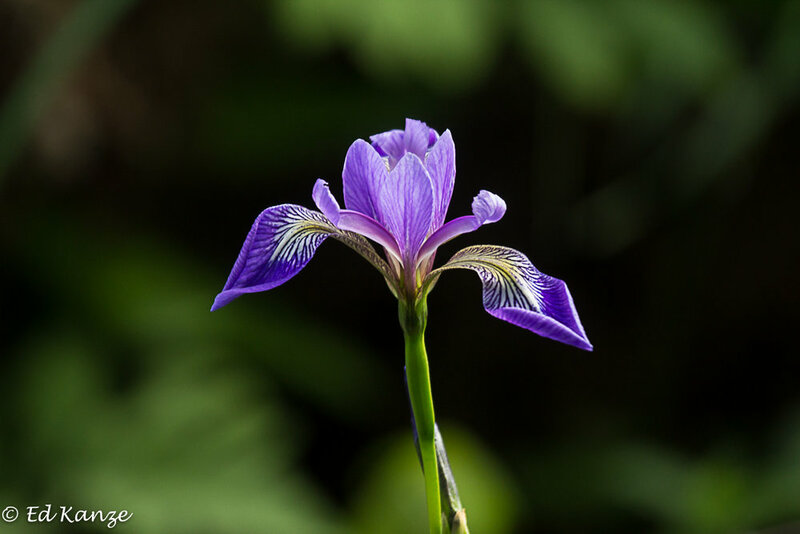 It has no male flowers with pollen-producing stamens but bears female blossoms only. These are ruby red. Each flower has a pair of sticky, fuzzy styles adapted for catching pollen. Wind and insects both play roles in moving red maple pollen from the male flowers to the female. 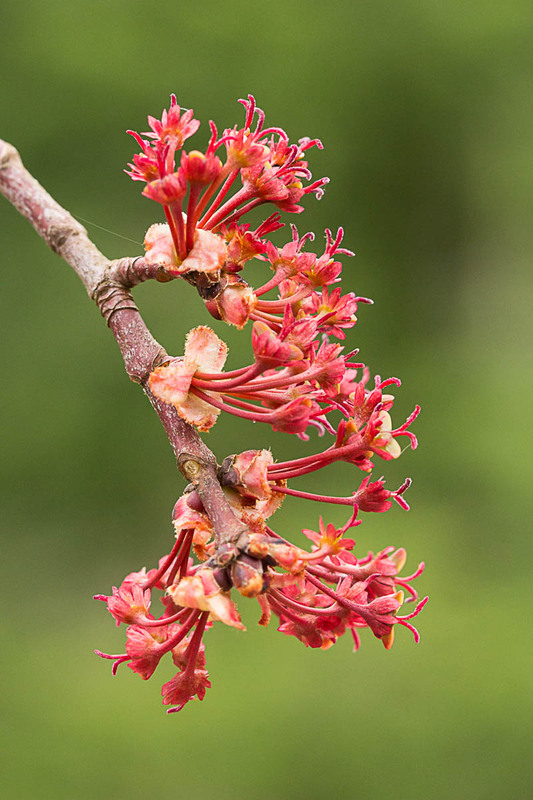 See a second image of female red maple flowers immediately below. Gorgeous, aren't they? Let's not forget about the male flowers, shown in the two photos below. From a distance, these appear not ruby red like the female blossoms, but orange. 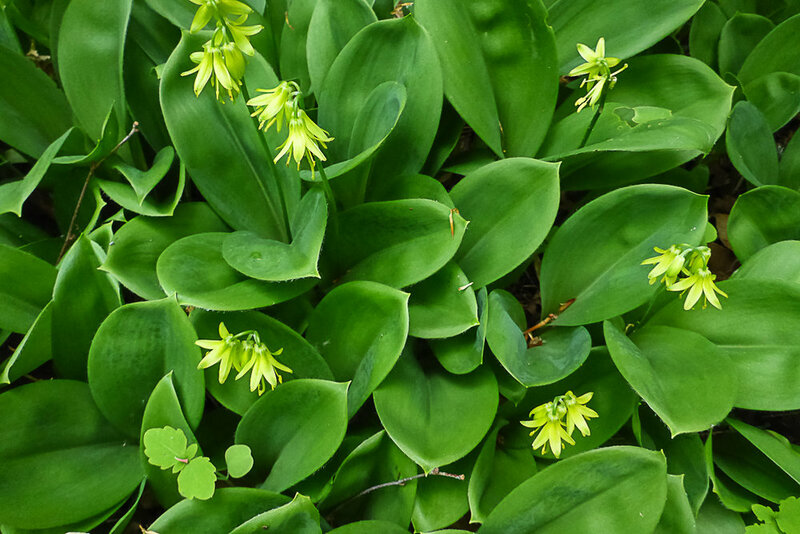 This is because they have conspicuous yellow flower parts in addition to red anthers and bud scales. The combination of yellow and red creates the visual impression of orange. 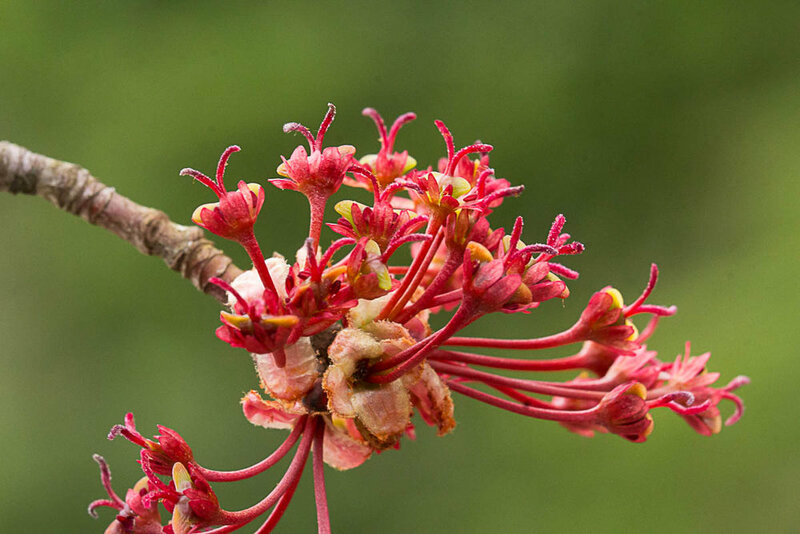 The number of stamens in a single red maple flower varies. Commonly it's eight, but it can be more or less. The stamens have red or yellow filaments topped with anthers. When fully developed, the anthers are red on one side and yellow on the other. The yellow is pollen. The reproductive lives of red maples are complicated. While the majority of trees in a given area usually bear male and female flowers on separate plants, there may also be bisexual (the botanical term is monoecious) individuals bearing blossoms of both genders. We have such a red maple outside our kitchen door. The tree is largely female, yet one branch bears male flowers. When hiking in spring, I tend to find bisexual red maples particularly in rocky exposed areas, where the plants grow under stress. And to make matters even less clear, certain flowers on a red maple tree may bear both female and male parts. Maybe there's evolutionary method to the red maple's reproductive madness. Diverse ways of making seeds likely help the tree adapt to a wide range of environments. 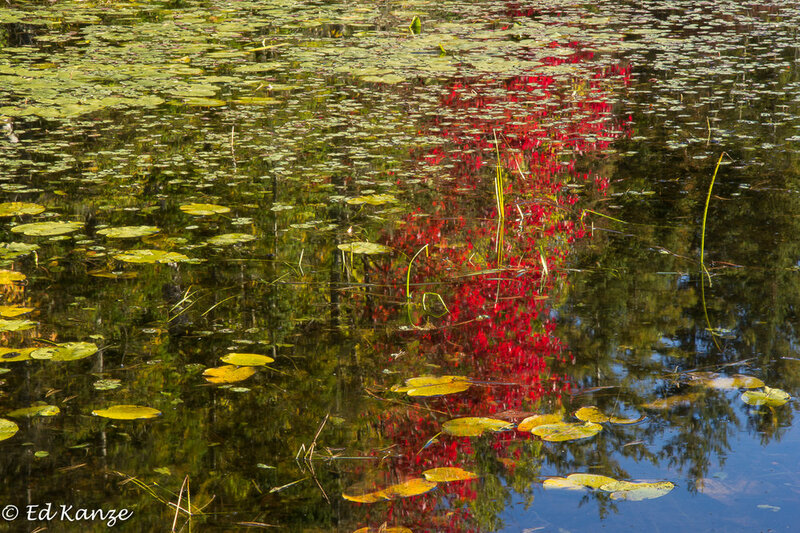 You'll find red maples growing from the steamy alligator and cottonmouth-haunted swamps of the Florida Everglades to Newfoundland and the chilly interior of Quebec. In the Adirondack Mountains, red maples grow just about everywhere except on high summits. 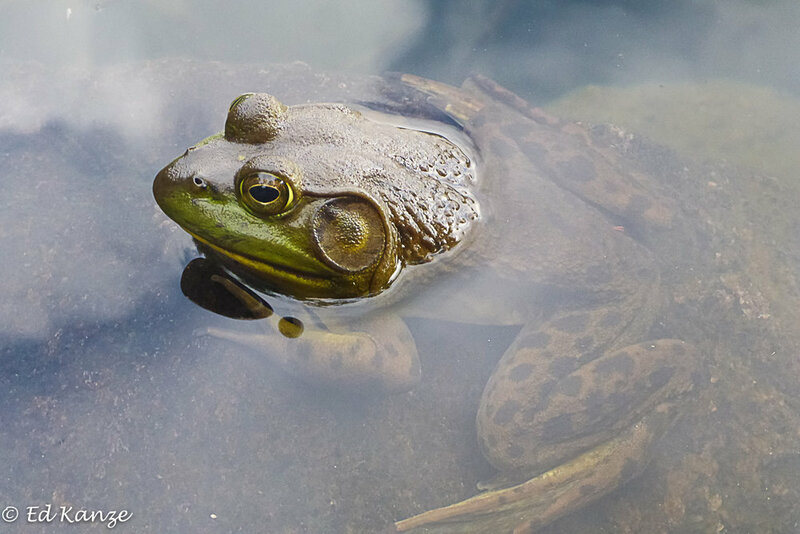 You'll find them at home in waterlogged swamps, on dry, windswept ridges, and on a variety of slopes and flats. Red maples please the eye in spring when in bloom, and they're stunning all over again in autumn. In September, the leaves turn the same deep, brilliant red as the female flowers of springtime. The Adirondack winter ran long this year. As cabin fever set in, we put our goats, ducks, and guinea pigs in the hands of friends and neighbors and set off on a twelve-day adventure in Costa Rica. For the first five days, we chased birds, mammals, lizards, crocodiles and whatever else we could find in the distinguished company of Swarovski Optik's Clay Taylor and Alex Villegas. 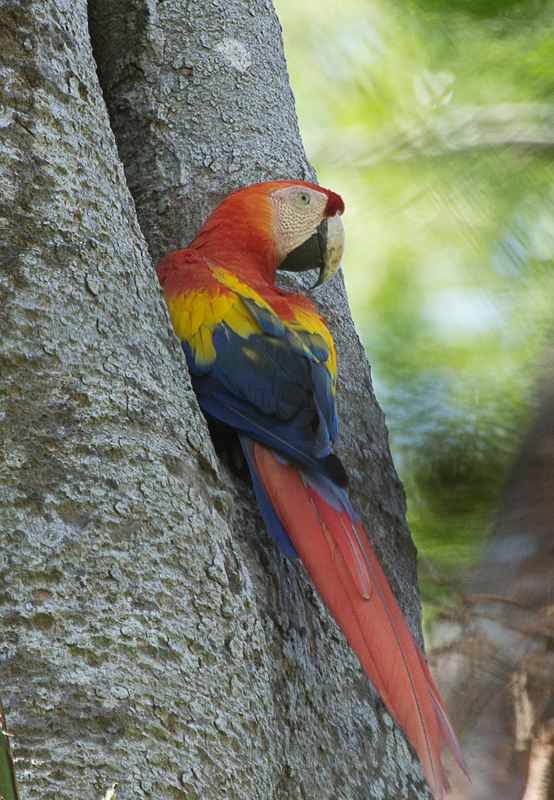 Alex's wife and five year old daughter were with us, too, as well as a fabulous bus driver named Marco Morales, who proved himself immensely knowledgeable about birds and one of the best fauna spotters of us all. 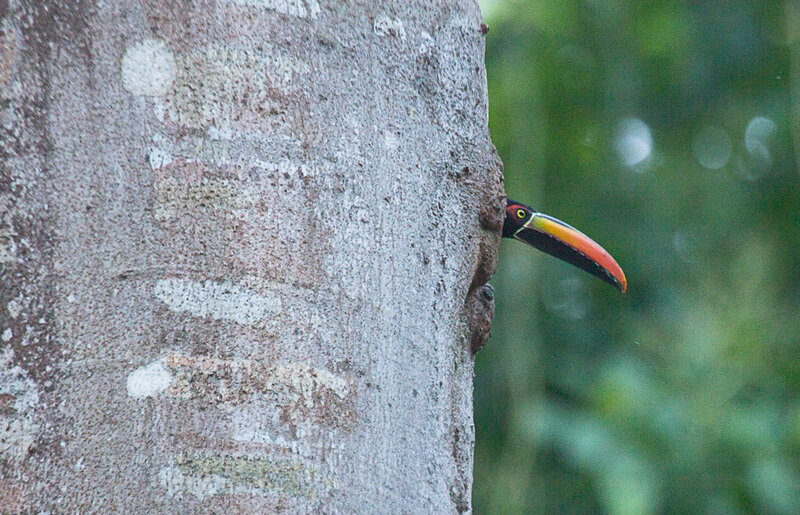 One of our favorite birds during this phase of the trip was the red-headed barbet, shown above, and the fiery-billed aracari, a kind of toucan, shown immediately below, poking its formidable and colorful beak out of a nest hole. 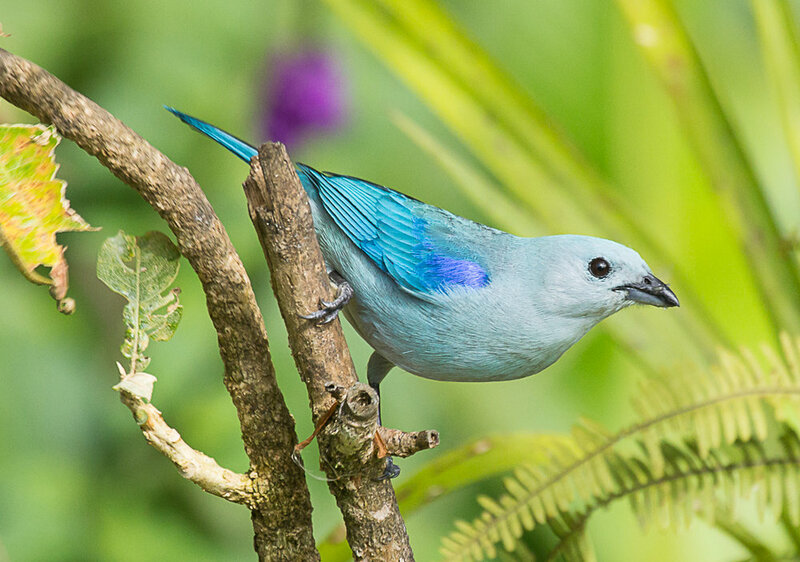 Other exciting finds during this first part of our Costa Rican adventure included (in the order they appear below) the long-tailed silky flycatcher, the giant parrot known as the scarlet macaw, and the green-and-black poison dart frog. 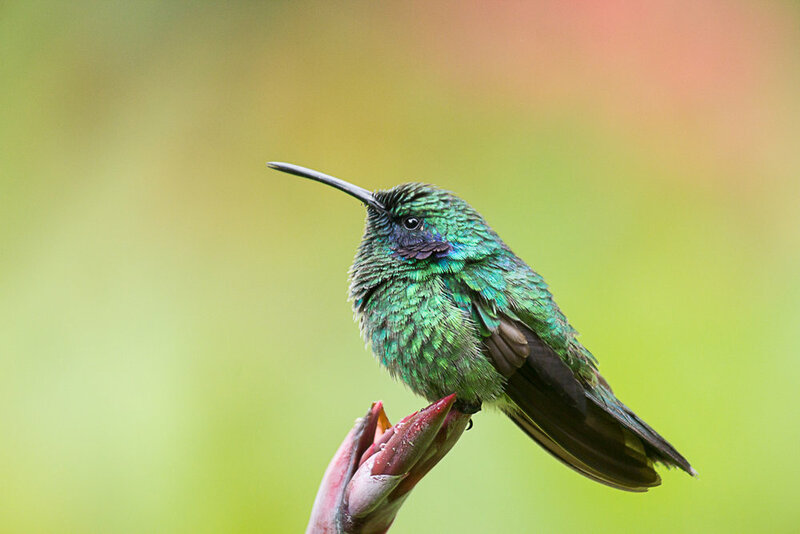 After our memorable stops at Villa Lapas, on the Pacific Coast near Tarcoles, and Savegre Mountain Lodge, high in nearby mountains, we bade goodbye to our Swarovski friends and found adventures on our own. First stop, reached by a memorable and sometimes teeth-rattling half day ride into the mountains north of San Jose, was the Reserva Monteverde. 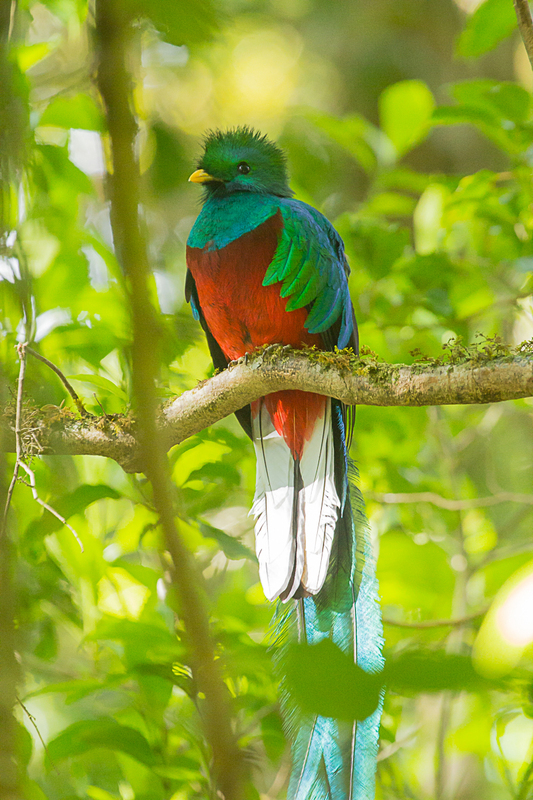 There we had our best looks of the trip at the most celebrated bird of Central America: the resplendent quetzal. Here are three photos. 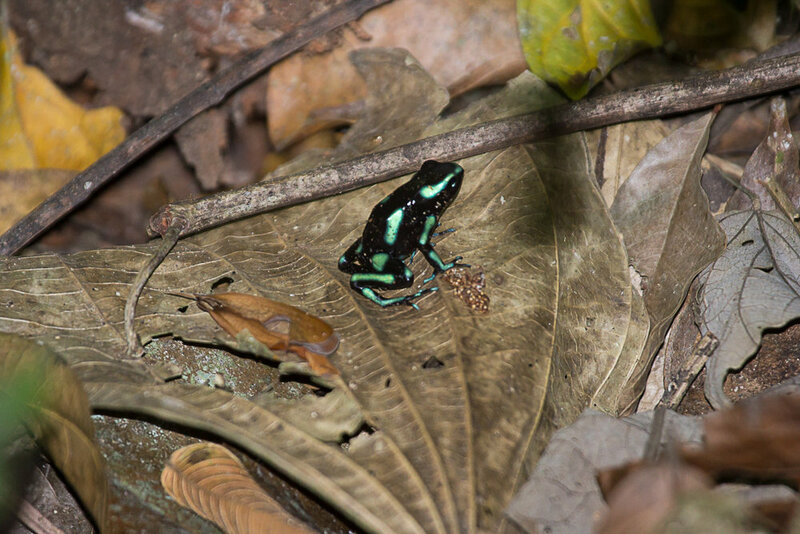 The first two show a male. 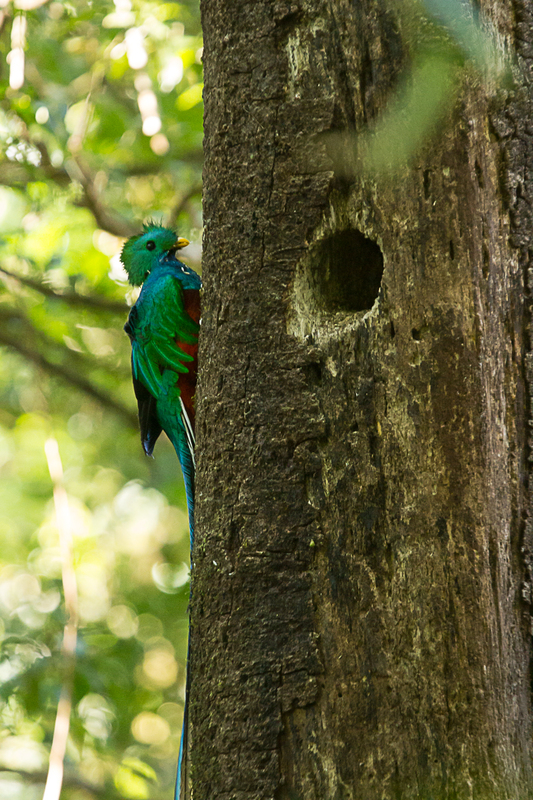 The third shows a female quetzal, less extravagantly plumed than the male but quite handsome in her own right. 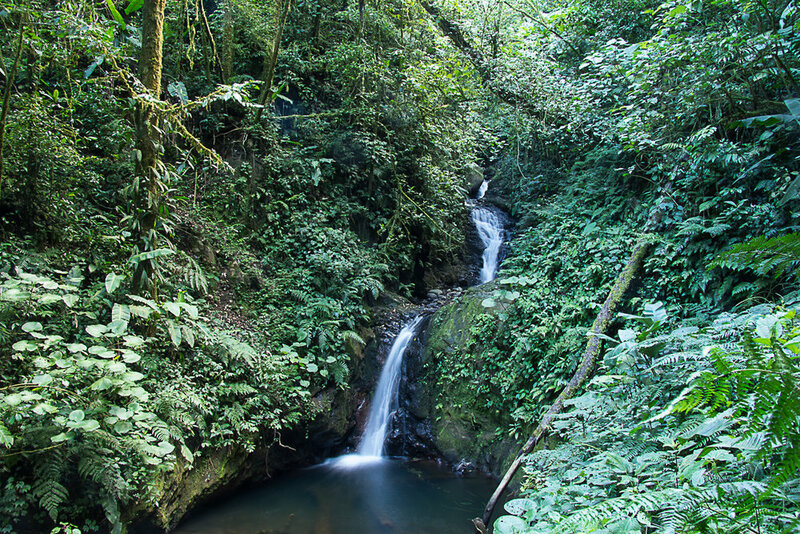 Our last major stop in Costa Rica was Rancho Naturalista, a small, beautiful, and welcoming eco-lodge in the hills near Turrialba. It was a fine place to conclude a trip memorable from the first day to the last. We ate delicious food, slept soundly each of our three nights, and with binoculars and cameras hunted for wildlife from first light to sunset. Accompanying us on several of our walks was Harry Barnard, a young, companionable, and erudite guide from England who spends part of each year at Rancho Naturalista. He was fabulous. So were the things he showed us. 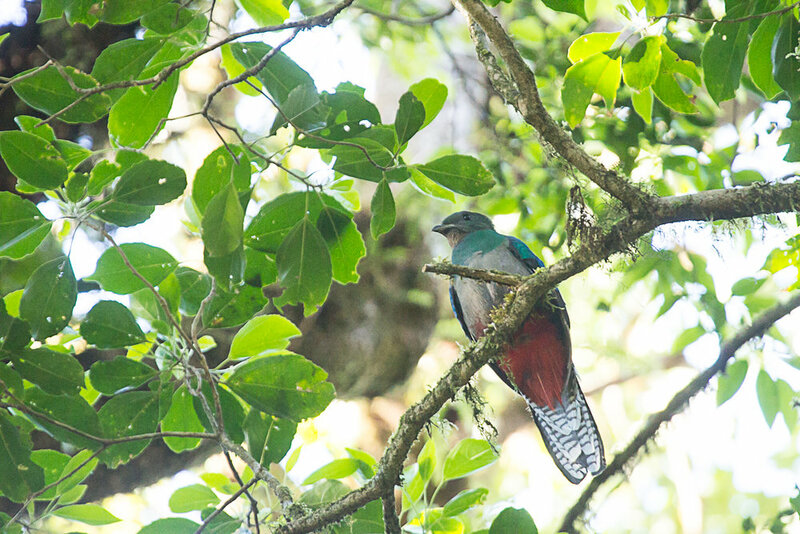 Examples below: blue-gray tanager; crowned woodnymph (a kind of hummingbird); a lineated woodpecker, in the genus Dryocoups, making it a cousin of our pileated woodpecker; and a green basilisk (the must stunning lizard of a trip that brought us sightings of many). 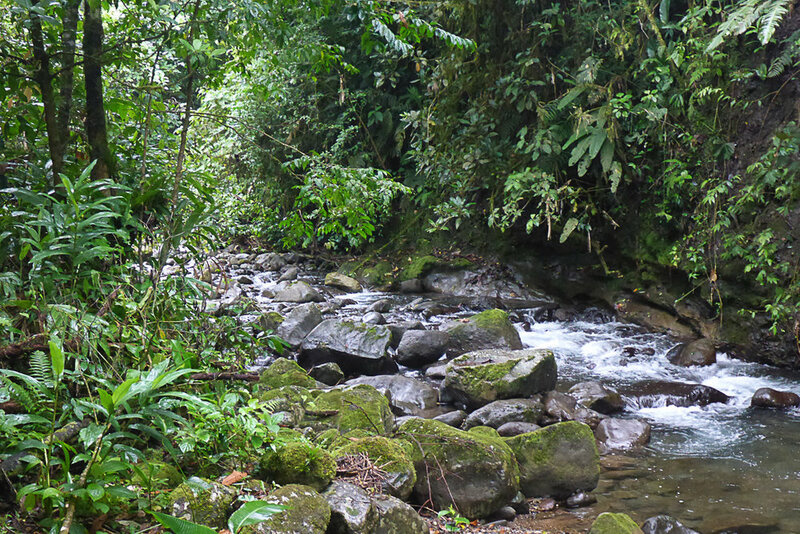 I'll end this quick tour of our Costa Rica adventures with two final images from each of our four fabulous stops: Villa Lapas; Savegre Mountain Lodge; Monteverde, and Rancho Naturalista. Viva Costa Rica!